Before I moved into my current apartment, I took a tour of the building with the developer. During the renovation, he and his crew tried to use as many recycled materials and environmental practices in the building. I noticed the lining of the window sills were an odd material, like a chicer looking linoleum. He told me it was marmoleum. 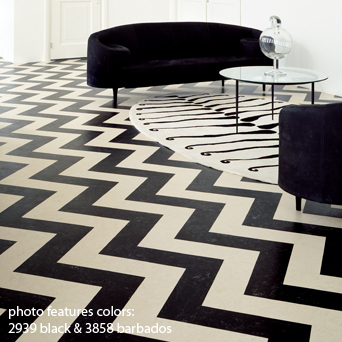 Marmoleum is a great option for flooring if you have allergy or asthma sufferers in your home. The bones of marmoleum are all-natural, produced from linseed oil, jute and limestone, so no off gasing or VOC’s. The Natural Abode offers a sample set of marmoleum that you can test drive in your home. It’s a glueless application that can click into place over any existing floor – from concrete to sheet flooring. Forbo flooring has the most extensive selection of marmoleum out there and they have a great design gallery and over 24 colors to choose from. Let me know if you have used marmoleum in your home and what you think. I also hear it’s a great surface for breakdancing!